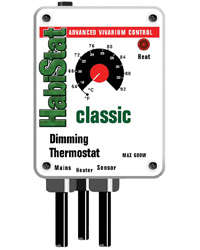 Sophisticated Dimming thermostat, designed specifically for controlling light bulbs. The Dimming thermostat is one of the most accurate methods of temperature control and whilst it is perfect for controlling light bulbs, it can be used on almost any heaters. Unlike other Habistat thermostats, it does require a minimum load of 40 watts, but has a maximum capacity of 600 watts at 230 volts. This is the only thermostat we recommend for use with incandescent light bulbs. It uses the latest technology and operates in a manner similar to the Pulse proportional thermostat. Instead of pulses of power being supplied to the heater, it is supplied with a continuous variable supply of power or voltage. In principle this has a similar effect to light dimmers or rheostats in your home. If the Dimming thermostat is being used to control a primary basking spot, then the size of the heater needs to be engineered to the temperature required and the size of the enclosure. In other words, if the heater is too large then it will be running at a very low level. Clearly, not what is required of a basking light. If the wattage of the light bulb is reduced, then the intensity of the heat locally will be greater, or proportional.